Have you ever had a family tradition that you thought was the same across all families? Like turkey at Thanksgiving; it's what everyone does, right? 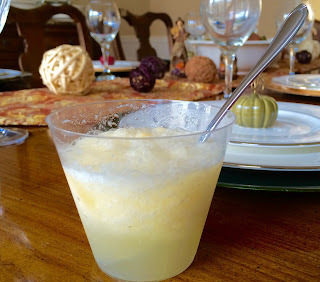 I don't remember when I first discovered that not everyone has "slush" at Thanksgiving and Christmas, but I do know that I'm still disappointed to find it missing when I visit other people's homes for the holidays. With Thanksgiving at my house this year, I knew I had to once again teach my in-laws about holiday slush. My grandmother keeps our slush recipe in her famous family cookbook (the one she gives to the grandchildren when they get married, meaning she refused to give me one until my wedding at age 29). I had a couple problems with this recipe. 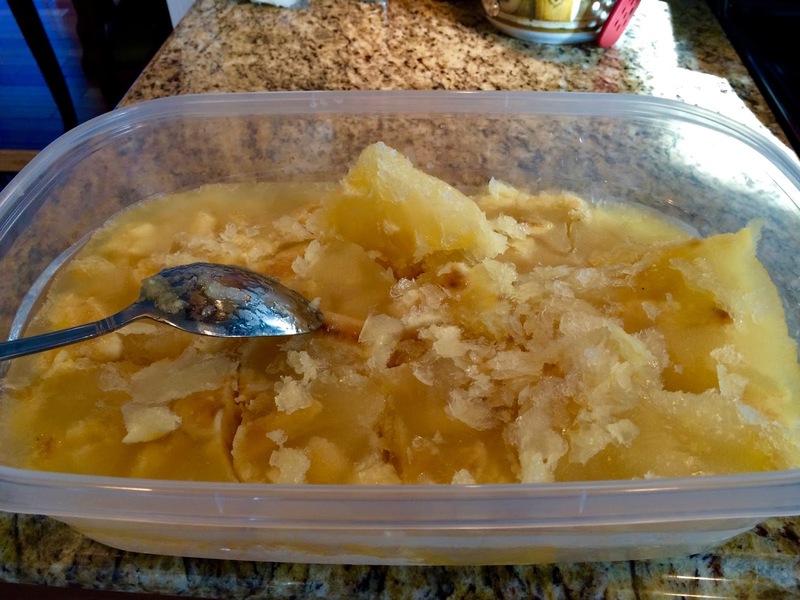 First, it makes enough to serve my grandmother's entire family (consisting of 6 children and their spouses, 25 grandchildren and their spouses, and I don't know how many great-grandchildren). In other words, for my group of 10 adults, I really only needed half of the recipe. But the amounts were weird and not easily divided in two. Also, once upon a time, when my grandmother wrote down this recipe, the grocery stores carried giant 46 ounce cans of pineapple grapefruit juice. At some point in the last 30 or so years, these special mixes became unavailable. So, in order to half the recipe, I needed 12.5 ounces each of pineapple and grapefruit juice. Not the easiest of measurements. And so I just rounded it to 12 ounces, or 1.5 cups each of the juices. I rounded a couple of the other amounts to make things easier, and there you have it. I hope my in-laws love it as much as I do, but if not, I'll have no problem eating all the slush myself! This is definitely a make ahead of time recipe, which is fine because it keeps very well in the freezer. 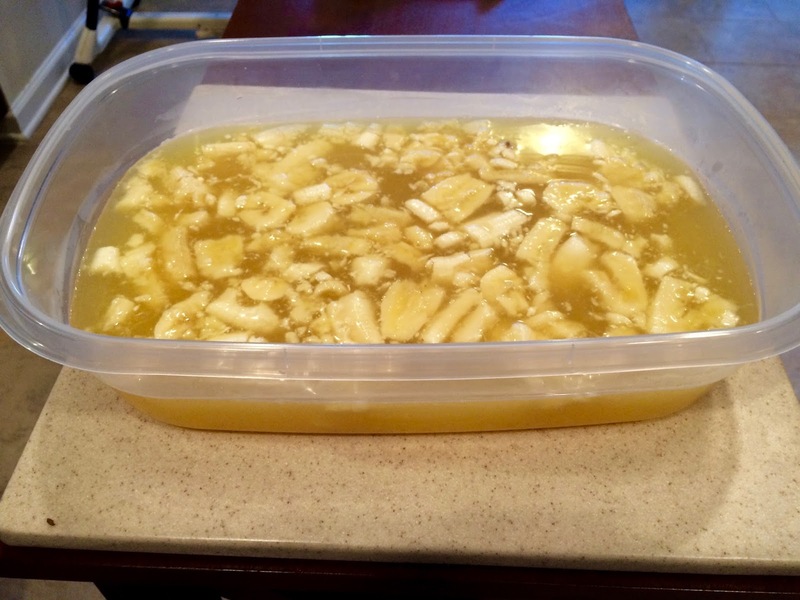 Make a syrup of the sugar and water, and mix it all together in a large tupperware or pan. You want something wide enough that you can easily serve from, but tall enough that when you mix it, you won't wind up with more on the floor than in your pan. I like to let it freeze overnight. Then, at least a day before you serve it, take it out and let it defrost for an hour or so. 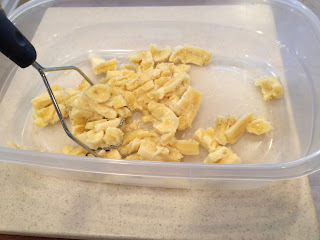 Break it up into chunks with a large spoon, and then attack it with a hand mixer. This part is super messy, so wear an apron! Once it's light and fluffy, return to the freezer. With it whipped, it's easy to serve with an ice cream scoop. Serve as an appetizer with Sprite or your favorite lemon-lime soda. A wonderful holiday treat! Make a syrup with the sugar and water over medium heat. 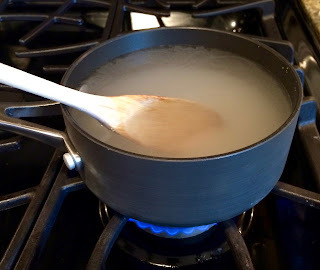 Once the sugar is completely dissolved, remove from heat and allow to cool. 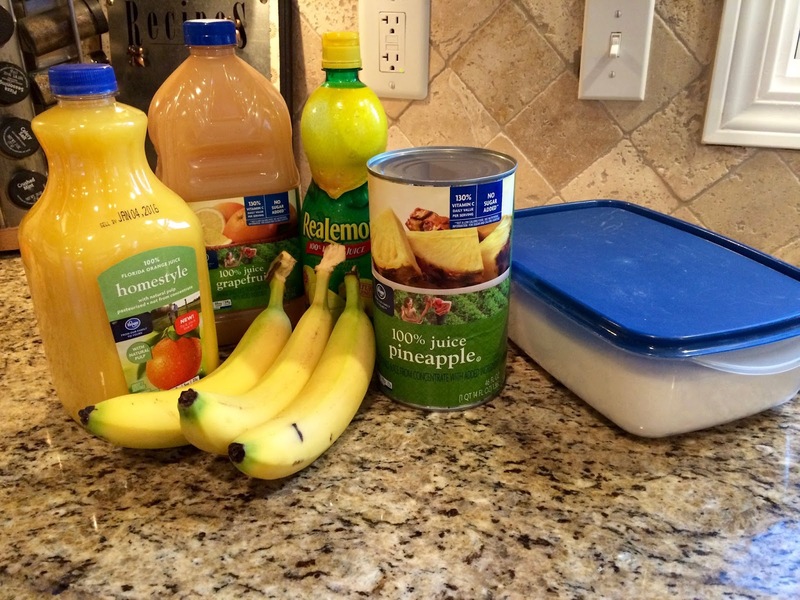 Mix all ingredients in a large tupperware or pan. Slowly add the syrup. Place in freezer until set, at least 5 hours or overnight. At least 2 hours before serving, remove from freezer and allow 1 hour to defrost. 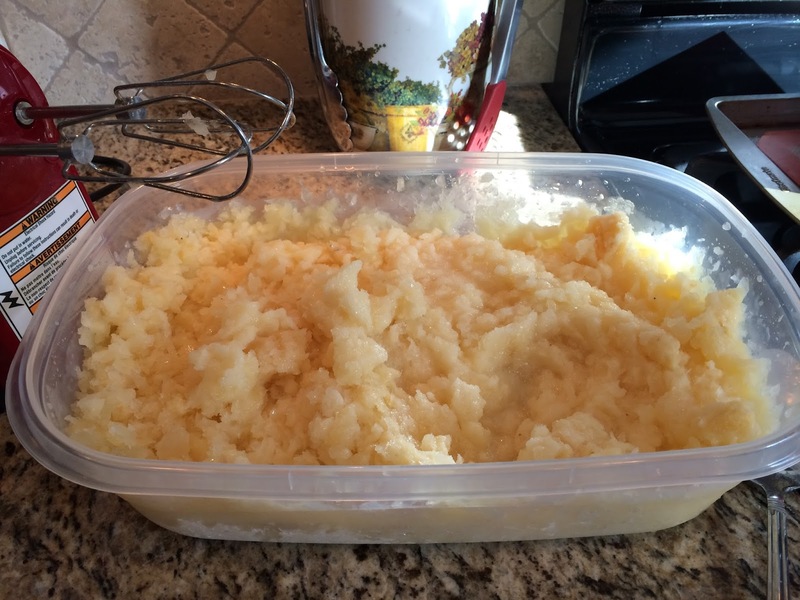 Break ice apart with a heavy spoon, then whip with handheld mixer until fluffy. Return to freezer. Serve straight from freezer as appetizer with lemon-lime soda. It's one of the best traditions! This looks fabulous. I love the word "slush" too! Thanks for sharing on Inspired by You. I would love to pin this recipe to our group board but didn't see a pin feature. Please come back again on Friday to see our features and on Sunday for another link party at 10:00 am. Happy Thanksgiving! Hi Susan, thanks for coming by! I'm clearly still new at blogging and making things easy to find. The Pin button is at the very bottom under my Link Party List. I also have this recipe pinned to my personal board under Megan Stebar. Hope that helps and Happy Thanksgiving to you too! Thanks, Molly. I hope you love it as much as I do! I have this recipe and love it, but haven't made it in years! We have a traditional Cranberry holiday drink, but it's not a slush. I got a new Christmas slush recipe a few years ago that is yummy too. Thanks for sharing with Share Your Cup. Thanks, Jann. I love how there are so many variations of this. Thanks for visiting! Wow! This looks so yummy! I'm featuring your slush at our New Years Eve features post. Thanks so much for linking up with us at Best of the Weekend! Hi Jenna! I'm so glad you liked it and thank you for the feature! Happy New Year!